Soft bursts of lightweight foam gently wash away dirt and germs, while leaving skin soft and lightly scented with a sweet blend of watermelon and cantaloupe. Soft bursts of lightweight foam gently wash away dirt and germs, while leaving skin soft and lightly scented with an addictive blend of marshmallow, toasted sugar with hints of roaring campfire, honeysuckle and vanilla. Soft bursts of lightweight foam gently wash away dirt and germs, while leaving skin soft and lightly scented with a juicy blend of fresh picked apples. Soft bursts of lightweight foam gently wash away dirt and germs, while leaving skin soft and lightly scented with an addictive blend of pumpkin pulp, fresh ginger, hint of rum and creamy vanilla. Natural ingredients and powerful germ killers get hands clean and lightly scented, wherever you go. Includes 3 PocketBac, one in each of our glow-in-the dark scents. 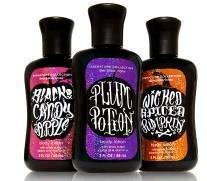 We've made it easier than ever to try our spooky new scents with our Mini Body Lotion Bundle. Our exclusive Signature Body Lotion formula, fortified with powerful ingredients like super conditioning Shea Butter, fast absorbing Jojoba Oil and protective Vitamin E, hydrates skin with moisture that lasts all day. Our non-greasy formula absorbs quickly and completely to leave skin feeling incredibly soft, smooth and nourished, making it the perfect daily moisturizer. I Love It! 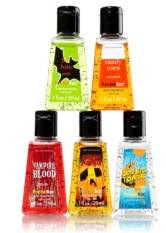 Bath and Body Works always puts out great stuff for Halloween! Available now at Bath and Body Works! I'm going to B&BW this week to get some Halloween products!! I also love Philosphy's Halloween line too!